I read with some astonishment that Tiger beer, brewed in Singapore will be trialled on draught in the UK. The bottled version (the way it is drunk almost exclusively in the Far East) is already imported here and has been for years. On one hand it underlines the paucity of decent UK brewed lager, but in a time where we are all being asked to look to our green credentials, some numpty has decided it would be a good idea to drag even more of this undistinguished beer 6750 miles (Singapore - London distance) to the UK. How's that for a carbon footprint then? Is it just me or is this a completely pointless exercise? Is it being done just because it can be done? Tiger is an inoffensive all malt brew of little distinction. It is the the flagship brand of Asia Pacific Breweries Ltd, and is brewed in Singapore, Thailand, Vietnam, Papua New Guinea, Cambodia, Malaysia and China. I was set to thinking by Southport Drinker, when in a response to Stonch, he mentioned that old classic drink, "brown bitter". When I played in various Darts Leagues in Liverpool, it was inevitably keg beer in the Social Club League in which I played for St Anthony's of Aigburth and mostly cask, as most beer was then, in the Merseyside Civil Service Darts League. Most of us, cask ale men in the main, when in social clubs, consequently drank brown bitter, which was indeed a very popular mix in Scousley. (I believe in the Midlands a brown bitter was unattractively called a "brown split". I don't think I'd fancy asking for one of those!) 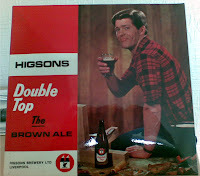 The bottled brown ales all had their differences in terms of body and sweetness, though all were inevitably on the sweet side of the brewing spectrum with the possible exception of Higson's Double Top. In those days you knew where you were with beer. Each pub or club sold the beer of one brewery, with many selling Mann's Brown Ale in addition. Greenall's had "Bull's Eye Brown" a pretty good beer as I recall, Whitbread had "Forest Brown", Tetley and Walker's pubs had the excellent "Walker's Brown Peter" and Mann's, Bass I think just called their effort "Bass Brown Ale". To add to the variety available, there was on occasion in Tetley pubs, Ind Coope Brown Ale. Some deviants even added Jubilee Sweet Stout to their keg bitter! One advantage this drinking habit had was that the half pint of bitter was poured by eye and usually gave you a bit extra, which in these impoverished days, was a welcome bonus. You measured this simply by how much ale remained in the bottle after topping up your half pint while gleefully or dolefully looking at the measure others had got. Happy days. It was therefore good to read Stonch's review of Mann's, which, with a few notable exceptions in some regional breweries such as Harvey's and Holt's, is a survivor and in its own way, despite its peripatetic career, a genuine piece of brewing history. Perhaps less well remembered, but worth recalling are other beer mixes. "Golden" was a lager/bitter mix and "fifty" was a mix of mild and Guinness. I used to drink this in the Park Hotel in Tuebrook for a bit. Mild and Bitter was I think the same as it is now - A pint of mixed. It survives still. I poured quite a few on Saturday when I was working at the pub. I say survives, it clings on here and there where draught mild is available, but is a splendid reminder of how, when breweries produced little by way of variety, the drinker found a way to individualise his beer, though of course there were other more sinister reasons, historically at least, why bottled beer was added to draught. That's for another time though. Now with all the variety available, I miss the simple act of being able to make a bad beer taste better by the addition of a bottle of brown. I fact, I miss all these brown ales and all these breweries. Am I alone in thinking this? I hope not. Come on in - the water's lovely! • Has the Licensing Act had an effect on competition within the market? • To what extent have revisions to the framework codes of practice [from the British Beer & Pub Association] met the Committee's concerns? • To what extent are the codes applied by the Pubcos? • Is there a need for further regulation of the industry? I rather think that's a lot of mark up. No-one objects to the PubCos making a decent return on their money, but it should be shared with those who actually are leasing the business. Let's hope these monsters have their wings severely clipped. As previously reported here and elsewhere, Duvel Moortgat has acquired the whole production rights from the receiver of the bankrupt Liefman's Brewery. In a press release which is short and to the point, the company said "On 24 June 2008, Duvel Moortgat nv reached an agreement with the receivers of Brouwerij Liefmans nv. On the basis of this agreement, Duvel Moortgat nv acquires a large portion of the assets of the bankrupt companies, including the complete machinery, all the brands and recipes. Earlier, Duvel Moortgat nv had already made a binding offer on the real estate of Brouwerij Liefmans nv in Ouderaarde. The receivers have granted Duvel Moortgat nv a right of use until the completion of some procedural aspects of the sale of this site. In the first phase, Duvel Moortgat nv will concentrate primarily on the brown ales and fruit beers of the brand Liefmans brewed in Ouderaarde. This way, Duvel Moortgat nv can complete its existing product portfolio with a fine, authentic and traditional beer brand, in a market segment in which it was not active until now. When Duvel Moortgat nv acquires the site in Ouderaarde, the company will make the necessary investments to revalue the production site and give visitors a hearty welcome. The price of the total transaction, including the real estate in Ouderaarde, amounts to 4.5 million Euro." Good news I reckon and it certainly seems they are getting a bargain at that price. I have visited both breweries and have to say the welcome at Duvel was second to none. They are a good and friendly outfit. Here's hoping they make a good fist of it. I'm sure they will. For some reason I don't understand, the brewery is quoted by Duvel as being in Ouderaarde. It is of course Oudenaarde! There isn't much you can say in favour of Spanish or French mainstream beer, though at least the former doesn't have you gasping with shock at its price. I mainly stuck to wine, overdosing on all three hues. More of my Mediterranean sojourn another time. Last night was quiz night. It was an away game, but local for once and near my house. I walked into the Lancashire Fold, jaded and tired and ordered a pint of Lees Bitter. It looked wonderful and my first taste confirmed it was on form. After we were beaten by a very good team, we relaxed over lovely roast beef and roast ham sandwiches and enjoyed a couple more pints.The boys told me that the beer is on superb form at our local and that Lees Summer Sizzler is a cracker. I look forward to trying it, though I did have a sneak preview direct from the cask before I went away. We are in France now with crap beer such as Pelforth at prices that would make a grown man weep. Beer is needed only because of the heat, but red wine will fill the void best later. Yes it's hot and sunny now! The best we have had so far is Amstel and I don´t even know if it is brewed here in Spain or elsewhere. Red wine is a fine substitute! And I´m bittem to death by mozzies and it´s been cold and wet. Manchester doesn´t seem so bad! Tomorrow I'm off to Spain and France for around 10 days. I might get a chance to post, but I might not. Be good! My fellow blogger Tyson describes me, bizarrely, as "eye candy". Well I might have been twenty odd years ago, but now I am merely overwhelmingly attractive. He has detailed our night out last night on his blog and also mentioned that I drank a few pints of Tetley Bitter. Now I drank a lot of that way back in the day, though mostly the version that was brewed by Walkers of Warrington, not Tetley of Leeds. It was the same recipe though. That recipe prevails now and it is still a delicious, bitter-sweet beer of considerable character. I enjoyed it immensely. Alas the Warrington Brewery in Dallam Lane has long gone and the Leeds Brewery is under threat from those perpetual under achievers Carlsberg. In the meantime, the brewery founded by Joshua Tetley in 1832 still churns out decent beer from a big beer factory. I passed it today when on my way for a haircut. When on top form it is delicious. Don't believe me? I could say "try it and see", but I kind of assume that. Instead I'll say "trust me on this one." You might also like to try the light and dark mild from this brewery. Top notch too. PS. Back then it was Tetley Bitter, not Tetley's Bitter! This, in other words, is a mighty, powerful and possibly knock out bid. Watch this space. I didn't have a single mouthful of cask ale yesterday, but still managed to get sozzled. Not by intent - I'm too old for that malarkey - but through circumstance. I don't normally meet any of my better half's colleagues, not through some kind of curmudgeonly avoidance, but by happenstance. London is a big place and I'm rarely there during the week. I therefore hadn't met her workmate Bob before when we arranged to join him for a snifter in the Captain Kidd, a riverside Sam's house on Wapping High Street. Now the Captain Kidd is very pleasant despite selling keg beer only and on a glorious day, we bagged the prime seats beside two large open windows, looking out on a sparkling River Thames. My choice of beer was easy. Sam's brew a fine version of a German weiss bier, now divested of its Ayingerbrau connection, though it seems to me to be just the same. Bob joined us and it has to be said he likes an hour out. He drank the smooth bitter with practised ease, while E slid halves of Pure Brewed Lager down red lane. It was a great afternoon. After five pints of wheat beer for me and equivelant amounts for my companions, we were invited back to Bob's sumptuous flat in a converted warehouse overlooking the Thames. A couple of hours later and with two bottles of top class red inside us, we tottered off home. The evening passed in a blur, though I did cook a perfectly acceptable spag bol. On our way home from the cinema at the Barbican yesterday - Indiana Jones rocks - we popped into Dirty Dicks for one, as I wanted to see if Young's Bitter had improved any. It hadn't. Watery, barely hopped, with a dry aftertaste that went less than well with the aforementioned wateriness. I didn't have another. All character seems to have been removed from this beer. Views? Young's describes it thus: "Bursting with taste, Young's Bitter is an easy to drink, refreshing cask ale with a fresh, fruity aroma that leaves a long, satisfying bitter finish. It is traditionally brewed to deliver a clean taste and is light and dry in flavour with a subtle taste of hops." Yesterday morning was spent doing jobs around the flat, so I didn't set off until half past two for my chosen destination for an afternoon libation. Hopping on the 40 bus from Algate, my destination was the Charles Dickens in Union St, SE1. This is apparently, that rare beast in London, a genuine free house, selling a range of micro brewed beer. It wasn't that easy though. I'd looked on the map beforehand and wasn't too sure where to get off the bus, but jumped off roughly where I thought I should be. As it happened, it was outside Southwark Police Station, so I nipped in, being of a generation that asks a policeman. There was no-one else there and the helpful civilian behind the desk got his A-Z out and directed me 300 yards left and then it'd be on my left. That took me to an enormous gyratory, with no sign of Union St. I took the simple course and gave up, for the time being at least. Of course, being a veteran of such setbacks, I had a plan B. That was to visit Harvey's only London tied house, the Royal Oak in nearby Tabard St. This is a pub I've been meaning to go to for some time, so this was my chance. What a cracking pub. It feels like a genuine old style boozer, with a circular bar serving a back room and a snug as well as the neat public bar I was in. Lots of wood and old pictures etc. Pretty damn fine in my opinion. It was fairly empty with four or so regulars chatting away to the barmaid about this and that. What of the beer I hear you say, no doubt by now tired of the whole thing? Well it was Harvey's and none the worse for that. Perfectly drinkable, with that distinct Harvey's house yeast giving it an appetising spicy smack. A pretty full range was on and I tried then all. For the record they were: Mild, Knots of May, Pale, Bitter, Copperwheat and a golden ale, the name of which escapes me, but in any event was vinegar and was exchanged with very good grace. All were decent, all slightly on the warm side and slightly lacking in condition, though in fairness the pub was empty and the beer may well have been sitting in the lines. I probably liked the Copperwheat best as it simply had more about it, the wheat adding an extra dimension, as in truth the rest just tasted like tweaks of each other, such is the dominance of that very distinctive yeast. An honourable mention must also go to Knots of May, a light mild of some poise that I could have drunk more of. As I chatted to the regulars, I was pointed in the correct direction of the Charles Dickens which was, needless to say, entirely in the opposite direction to that indicated by the cop shop. I left the Royal Oak with a degree of reluctance. I'll be back. The Charles Dickens is about a half mile off Borough High Street. It isn't exactly charming, being quite dark and gloomy inside, but it is attractive enough, very clean with cheerful bar staff, has some nice pictures on the wall and seems to bring in a good cross section of customers. All good. But it is the ale that is the draw here. Six handpumps dispense beer from small brewers on an ever changing basis. On my visit there were beers from Slaters, Twickenham, Hogsback, Nethergate, Oakleaf and Cottage. In the way of London free houses, all but the Oakleaf were either very brown or in the case of the Twickenham very black. All were in perfect condition and served at a good cellar temperature. Top marks for this. Other London pubs please copy. I tried the Oakleaf "I Can't Believe it's not Bitter", a cask conditioned lager, which just tasted like a not very well executed golden ale. The Summer Beer from Hogsback was, bizarrely, brown, mostly malty with a touch of bitter hops. I really can't understand the thought processes here. Did the brewer really sit down and say to himself "I'll brew a refreshing summer beer. It will be brown and malty because that's just the dab on a hot summer's day!" Well he must have because that's what he produced. The Cottage Broadguage was copper brown and described as a "session ale". All I'd say to that is you're a better man than me if you could do a session on this sticky malt monster. I could have drunk a few pints of the Twickenham Gothick Dark which was roasty, caramel and bitter with a very good body to back it up. A very well made beer. Time was against me, so the Slaters and Nethergate went untried. This is another fine pub that I'll return to. Two in one afternoon (in London anyway) is a bit of a result. As I was finishing off my drink, I remarked to the helpful barmaid that I was surprised to find only one pale beer out of six. She mentioned that a pale beer was coming on later. "Had I ever had Top Totty?" she enquired. I was able to answer her truthfully that indeed I have. The Royal Oak is at 44 Tabard St SEI and the Charles Dickens is 160 Union St SE1. Both are Good Beer Guide entries. Worst Beer of the Year So Far! Instinctively I dislike writing bad things about micro breweries. I know the care and pride in their products that most of them have. Regrettably some have a blind spot. They have an inability to recognise a bad batch and even a bad recipe, never mind obvious brewing faults. There is frankly too much beer being released from micros that should never be sent to trade. I have though written about quality issues from small independent breweries and I came across the issue again last night from a (South West) brewery I have had trouble with before. The brewery describes the beer I unwisely purchased as "A golden coloured quenching beer with great hop character. Full fruit in the mouth with good hop balance and a long dry finish." The beer was light brown and smelt of creosote. Never a good sign. It was distinctly woody, phenolic and frankly, an undrinkable mess. Using my best Dom Jolly technique, I complained and had it replaced by the much more mundane, but drinkable Greene King IPA. For once I am not going to name this brewery or beer, but I will give a clue at the end of this article. The general point is that micros will only ever thrive by producing quality beer that pubs will re-order. No one in their right mind would re-order this stuff. Clue: The beer tasted woody. The brewery has obviously taken its name too literally in making this beer! When I was last down in London I noted that Shep's White Swan in Alie St has a cellarmanship award on its outside wall. The plaque has gone I observed as I strolled past today on my way to our flat. I am not sure what conclusion I draw from it though. If like me you have been wondering why Tyson's posts have suddenly dried up, I have the answer for you. It seems the Google Gremlins have been at him and he can't upload posts for the present. Or indeed since his last post. But he will be back as soon as he can get it sorted. So for the time being, you'll have to put up with me and the rest of us bloggers, but he assures me he is still supping and isn't even a bit dead. He's gone down the knocking shop to think the problem through. I think that's what he said! All this talk of lists on various other blogs almost dragged me in, except for one thing. I can never remember the best pub, or best beer, or favourite anything really, though obviously a few do stick in my addled mind a bit. One day I'll write them down, if I can remember and relevant brain cells haven't been killed off in the meantime. Instead I am prompted by Ron's thoughts of his hols to share what I'll be doing on mine with you. The Allgäu is a German region in the south west of Bavaria also extending some kilometres into south-eastern Baden-Wurttemberg The region stretches from the pre alpine lands up to the Alps themselves. That's where I'm going in August, directly after a week serving Bavarian and Franken beer at the Great British Beer Festival. Despite my avoirdupois being on the positive end of the scale, I'll be going by bike, or rather, once I get there I will. It is a few years now since I did one of these cycling tours, so I am bit trepidatious, but they are great fun and despite the 30 or so miles a day, fairly easy, especially if like me, you are not remotely embarrassed by pushing a bike up a hill. Of course, the skinny and incredibly fit E will accompany me. She doesn't have to push her bike much! Th ere will be beer too. I quick look at our route shows a veritable array of breweries, all I think new to me. 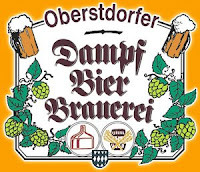 In at least two of the towns we stay at there are breweries or brew pubs including a Dampf (Steam) Bier Brauerei and those we pass through seem richly seamed with beery delights. So I'll be all right, though these days I have to watch my lunchtime intake as it goes straight to my legs! The map shows where we are going, though not our route as that will be "off road". Click on it to see it bigger unless you have particularly good eyesight or just don't care to. 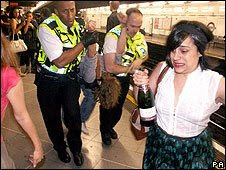 Various bloggers have been writing kindly about the last hurrah of drinking on tube trains and other London Transport before the ban came into being at midnight last night. They have been supportive of showing Boris that he is wrong and a spoilsport and of those holding "farewell" drinking parties on the tube last night. Predictably these so called parties ended in assault, vandalism, vomit and civil disorder, with several tube stations closed and many arrested. Now I regard this ban as wise and sensible. Who really wants to see people drinking on public transport, unless that public transport is properly equipped for the purpose? Not many I suspect. Most that "require" further drink on the tube will probably have already had too much, as in a kind of circular way, that's the only time it would occur to most people that it was a good idea in the first place. The tube can be difficult enough without the unpredictability being enhanced by a bit of in carriage boozing. This protest was ill advised, self indulgent and ended badly. It further advances the silly, but oft repeated caricature of a Britain where drinking is out of control and gives ammo to the anti drink lobbyists who are gaining ground. Ironically, it is likely to give a severe boost to Boris' efforts where he might otherwise have struggled. The law of unintended consequences clearly illustrated!